What's better than digging through mud? Digging through mud for treasure! Maybe I should have used a cooler activity, I dunno. Treasure X is the latest in the "it's all about the journey" blind-packed theme that's been showing up lately. Ready 2 Robot has tiered crates, Lost Kitties has Play-Doh, and Treasure X has... digging! 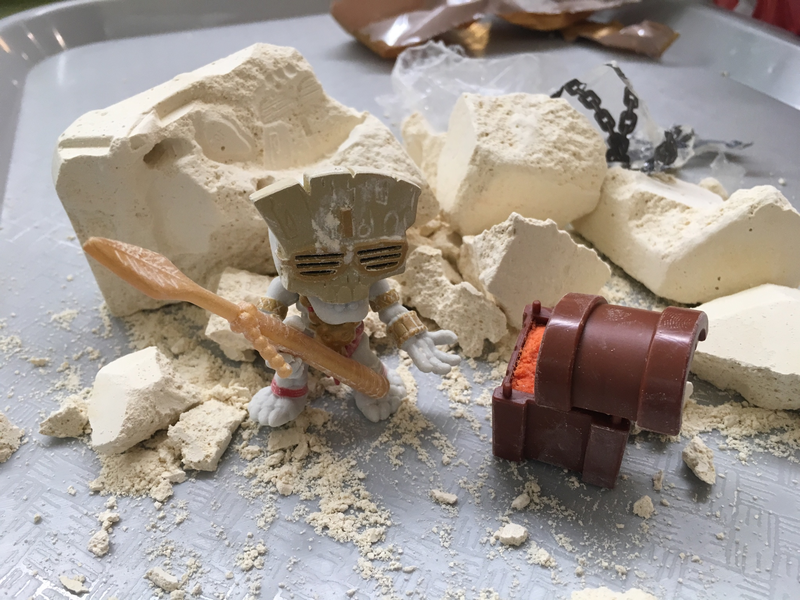 More specifically, you're digging for treasure - the figure and accessories are hidden inside a block of duty, sandy, rocklike clay. If you've ever played with those "fossil-digging" sets as a kid, you know what kind of material I'm talking about. In fact, let's take a look! Once again, I've got a video! Well, there you go! Just as an FYI, doing it dry isn't a problem - jut not as fast for a video. 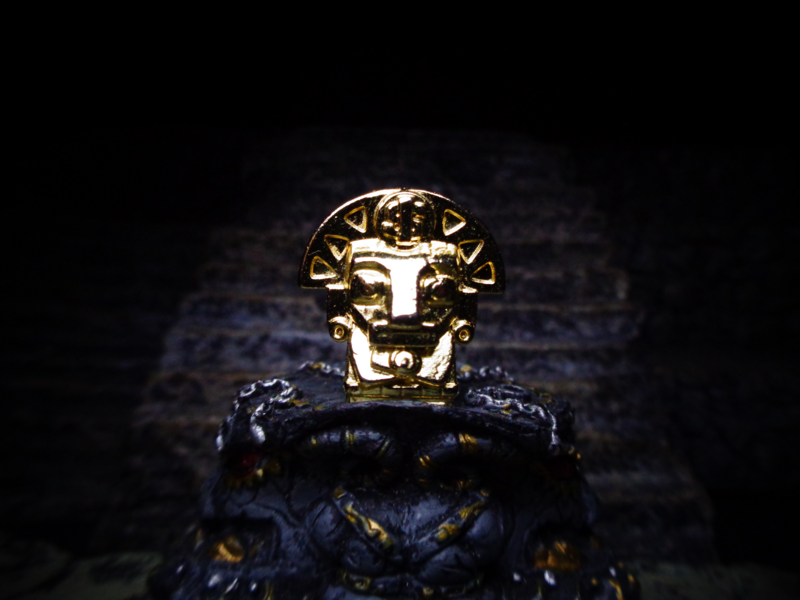 And since I recorded this, I've A: opened Treasure X in the company of friends (which is insanely fun), and B: found a gold treasure... which isn't vac-metallized, it's actually gold-plated! Dang. I mean, sure, it can't be more than $5 of gold, but gold treasures have some eight to them. It's pretty impressive. And concerning the former point, trust me on this. It's fun to chip through if you've got friends doing the same thing. 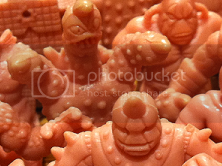 But anyway, let's take a look at some of the specifics of the line - the seven figures I've unearthed! As for what you get, each skeleton's parts are perfectly modular, meaning you can swap 'em. They're pretty good figures, surprisingly enough. 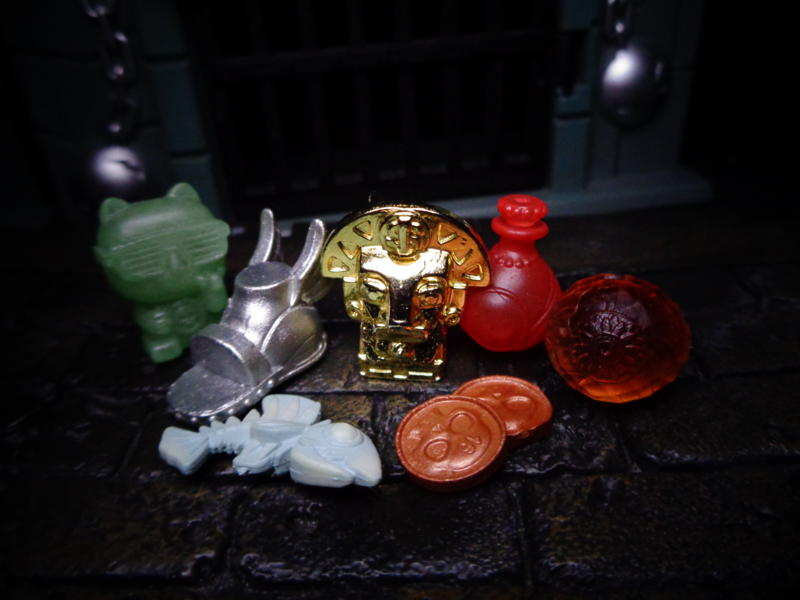 Their little treasures are small and usually plastic (or gold, haha), varying from metallic to glow-in-the-dark. 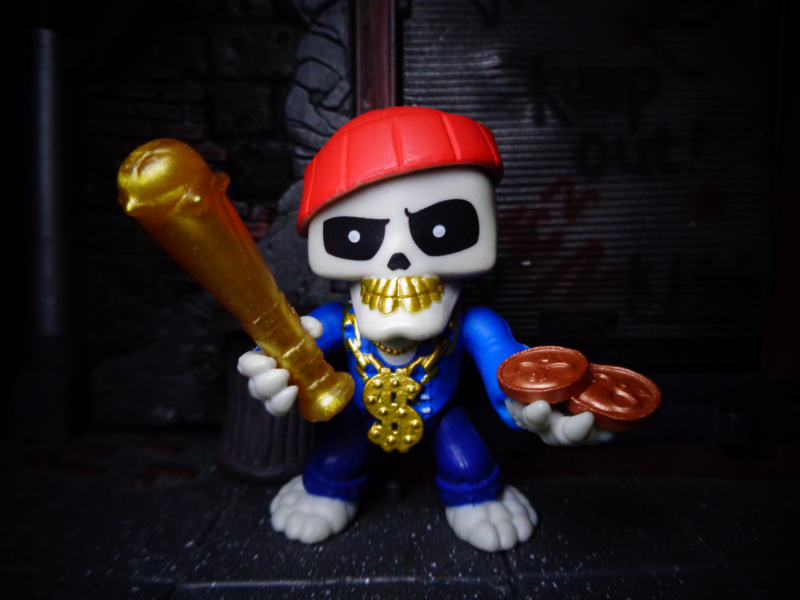 Each figure comes with an assigned piece of treasure, unless he happens to have one of the rare gold ones. Without further ado, let's take a look at these guys. 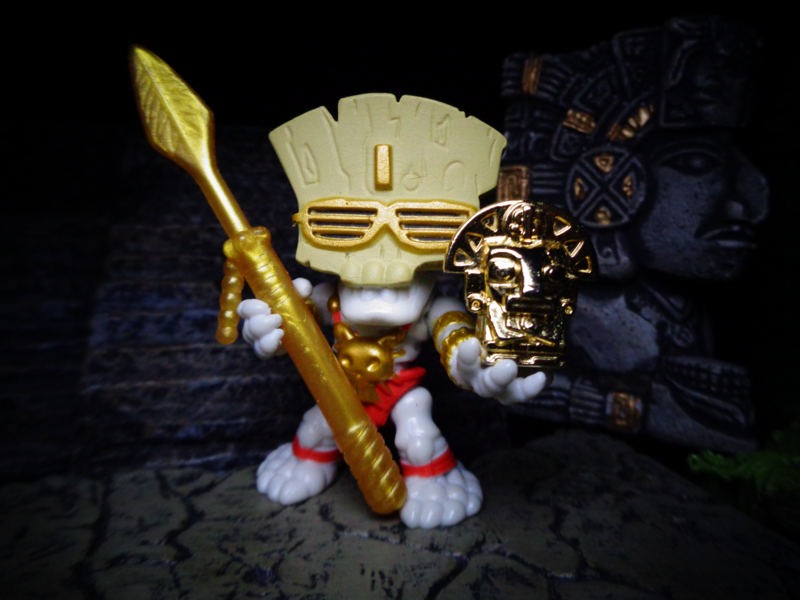 Holding the Golden Idol is Doctor Goldspell one of the three Aztec/jungle dudes. 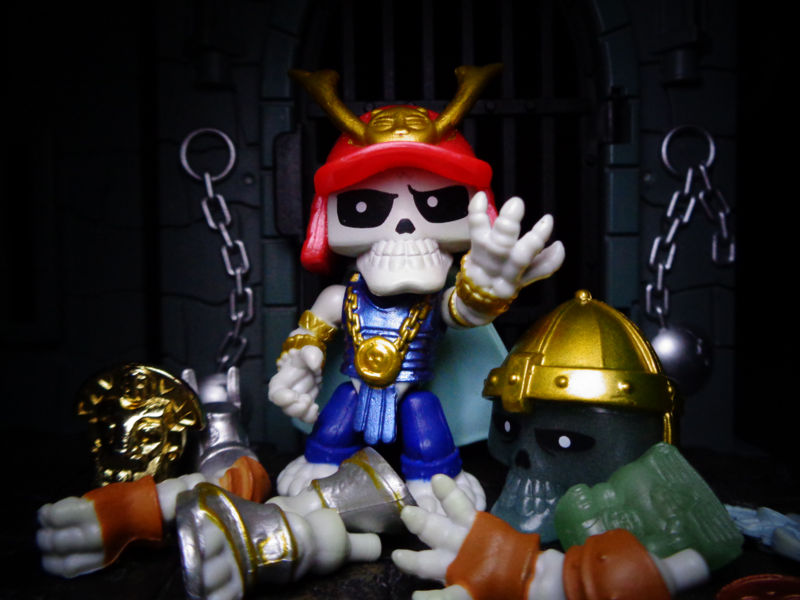 The various treasure-hunting skeletons are organized in teams of three. His usual treasure is a crystal spear head. It really is gold-plated! Seriously, that's incredible. 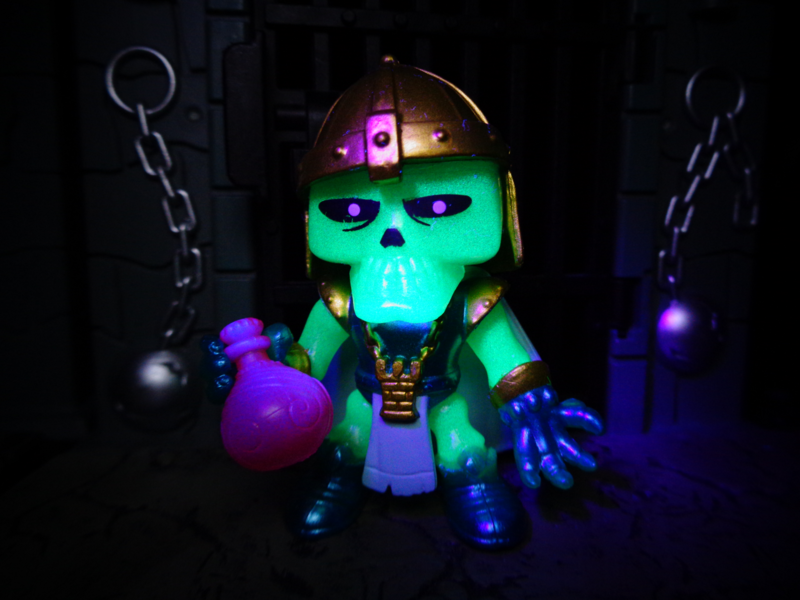 Lord Lootem is a rare glow-in-the-dark crusader! He also comes with a cape, which is an extra piece. 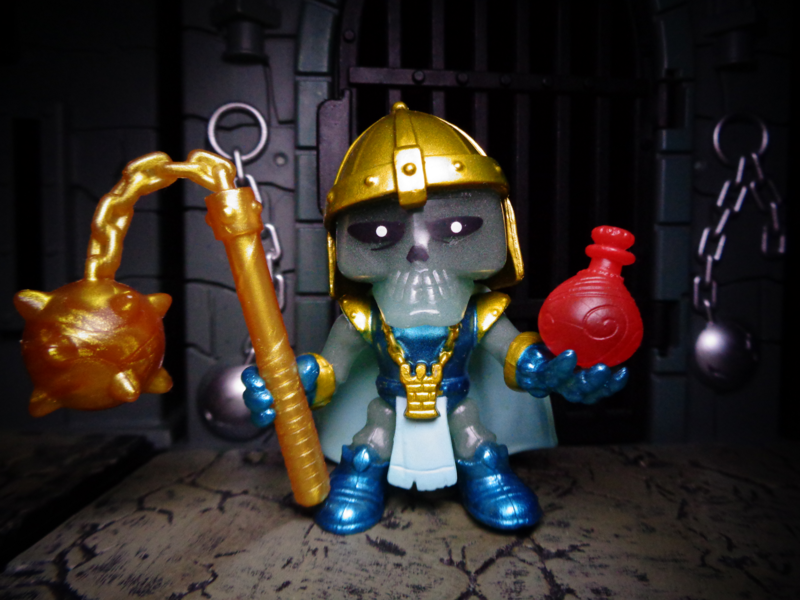 His treasure is the Magic Potion. He does glow! 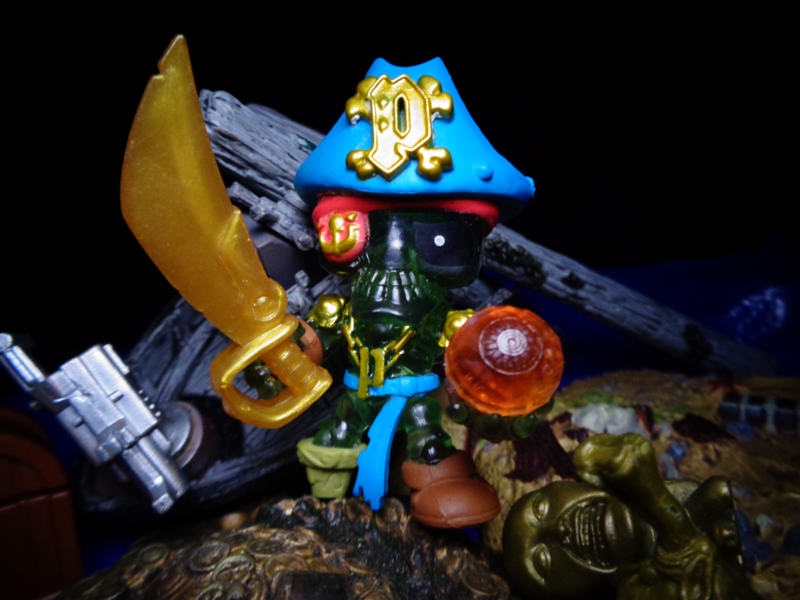 Also, his treasure can be held in his weapon hand, not just on his open hand. 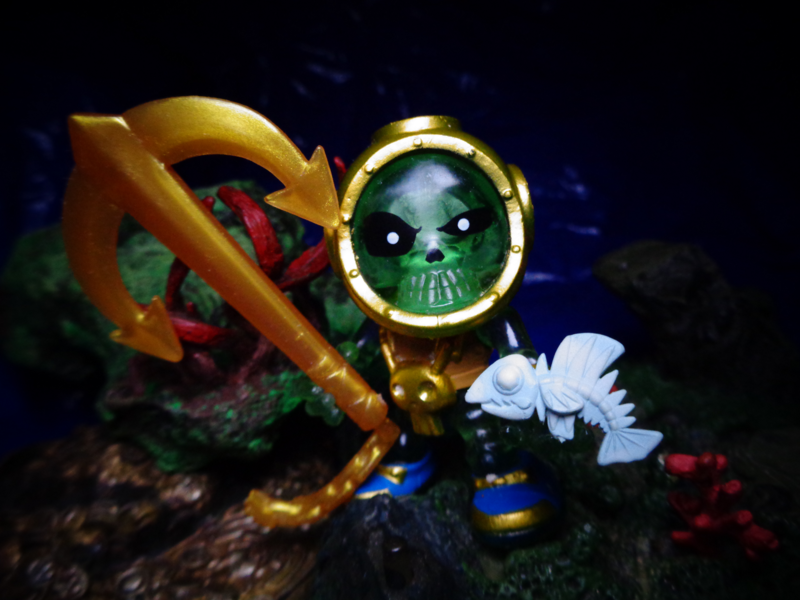 Gold-Diver is one of the Crystal figures, and his treasure is the Forbidden Fishbones. Which, uh... seems less valuable than some of the other treasures out there. 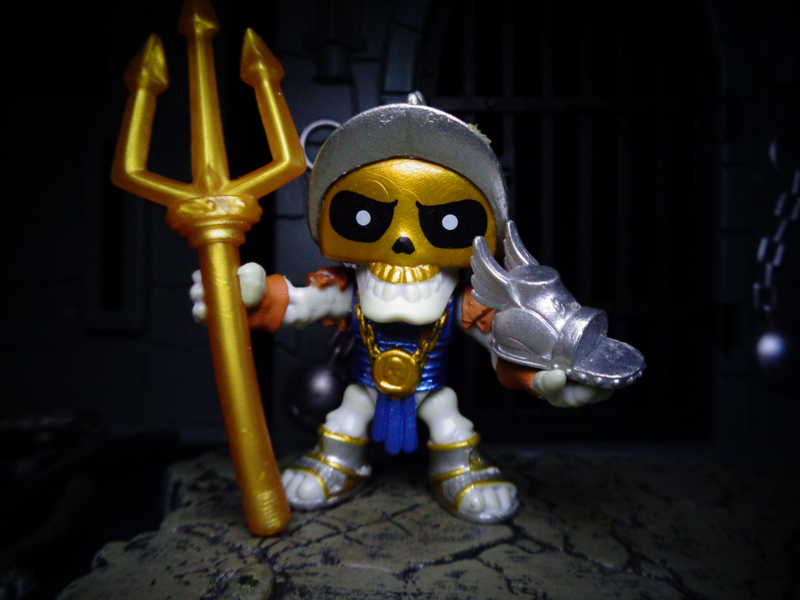 Another crystal is Captain Goldeye, who comes with the Crystal Eye. Mine is reddish, the others I've seen are perfectly clear. I think it got dyed by the treasure chest powder. 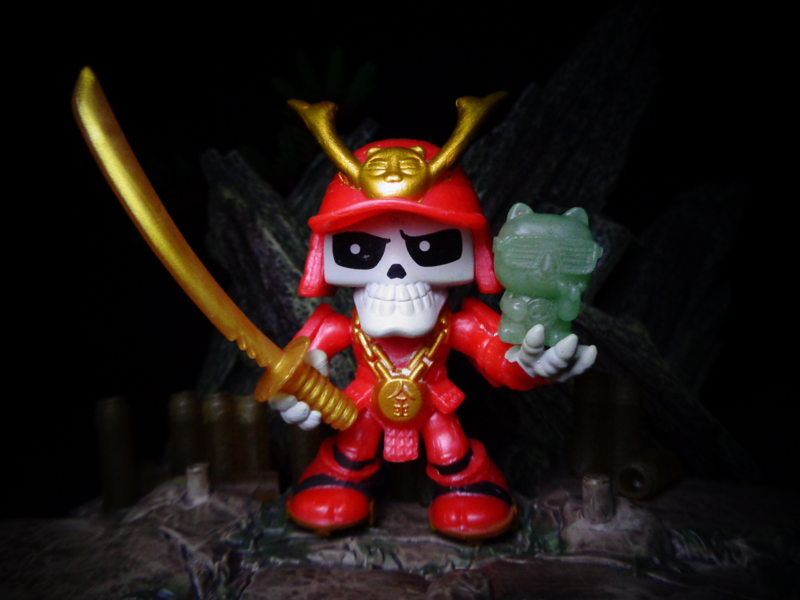 Goldblade comes with the Jade-Fortune Cat, which glows n the dark (not pictured) and apparently is wearing retro-'80s Kanye glasses. Goldius Maximus, a retiarus gladiato without the net, comes with the Silver Sandal. Rogue Goldsnatcher is surprisingly modern. He's either meant to be a gangsta, or Mickey from the Rocky movies. I vote Mickey. ANYWAY, he comes with the Bronze Sovereigns. Well, there you have it! 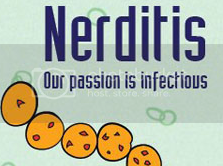 They're fun to open up, and the toys inside ain't bad, either! For extra fun, get a small group of people together, and open them in a mall food court! use trays to keep there from being a mess, and don't wet the blocks. That way, the mall staff won't HATE you, but trust me - it's fun. Good luck, and happy hunting! Edited by Ridureyu, 31 August 2018 - 02:09 AM. Great review. This is the first line of modern figures/toys that I really like. But the price tag is keeping me from trying for a full set. I originally bought four of them. And I also bought a three pack that I haven't opened yet. Love these skeletons. 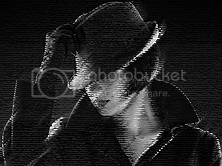 Whoops, I fixed a messed-up image! Great review, I will get a few once they go on sale. There are full boxes everywhere right now and I generally don't like blind packs but as you pointed out , these are pretty damn cool. Looking for the golden eagle Crest??? Anyone have it for sale?? ?